I just listened to Bill O'Reilly tell actor/activist Matthew Modine that we must kill all the "Islamic fundamentalists" in the world - wipe them off the face of the Earth - in order to protect America. 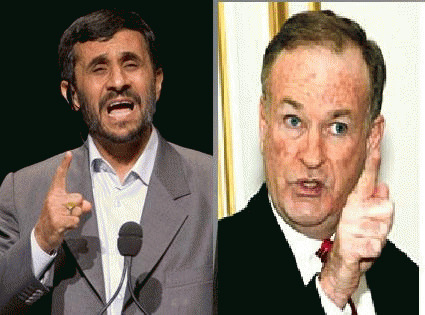 Modine asked O'Reilly how he would win the "war on terror". "You use every weapon you have to kill as many Islamic fundamentalists as you can, and then bring them to their knees, the same way we won WWII." "He was fighting to protect America. And he wiped out the enemy, just as we have to wipe out the Islamic fundamentalists..."
How, pray tell, does that differ in any way with the words of Iranian President Ahmadinejad about Israel that have been so vehemently denounced by O'Reilly and his far-right compatriots? They have raised non-stop holy hell over a comment made in a speech by Ahmadinejad in which he purportedly called for Israel to be "wiped off the map". This translation of his words has been hotly disputed, and the consensus of linguists and experts is that what Ahmadinejad actually called for was the fall of the Israeli "Zionist" regime, and the rise of a democratic government in which Palestinians participate in free elections. "The Imam said that this regime occupying Jerusalem must [vanish from] the page of time." Professor Cole explains that, "Ahmadinejad did not say he was going to 'wipe Israel off the map' because no such idiom exists in Persian". Rather, "He did say he hoped its regime, i.e., a Jewish-Zionist state occupying Jerusalem, would collapse." "What is really going on here is an old trick of the warmongers. Which is that you equate hurtful statements of your enemy with an actual military threat, and make a weak and vulnerable enemy look like a strong, menacing foe. Then no one can complain when you pounce on the enemy and reduce his country to flames and rubble." Other experts agree with Cole. "There is no new policy, they created a lot of hue and cry over that. It is clear what we say: Let the Palestinians participate in free elections and they will say what they want."